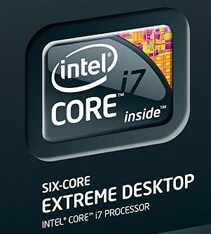 the Core i7-990X Extreme Edition runs on standard 3.46 GHz clock speed and when the Turbo Boost technology is lunched the cores will run @ frequencies of 3.6 GHz. Hyper-Threading feature allows the operating system will see 12 cores, with 12 MB of L3 cache and TDP-value is likely to be 130 watts. when we talk about the over clocking you should have no problems in clocking this processor past 4.5GHz on air, and 5GHz on water should be granted.